Nearly two hundred people gathered yesterday afternoon at the crossroads of Sodeco in Beirut to protest against violations of the rights of social minorities in Lebanon. The defense of the homosexual community was clearly the dominant theme of the demonstration, organized at the initiative of the Helem association, which has been fighting for the rights of this community for five years. The demonstration also condemned discriminations against “women, children, domestic workers, and others,” according to Helem’s communiqué. Standing in the rain near the entrance of a parking lot, participants waved rainbow flags and placards calling for equality of all before the law, in a peaceful and friendly atmosphere. Such openness is very rare in Arab societies. Homosexual couples are officially outlaws and avoid public display of affection to escape discrimination. Acts of violence against them are common and often go unpunished: a few weeks ago, two men were attacked by the police in broad daylight after being caught kissing in a building under construction in Sassine Square — an assault that has not been condemned by the authorities. Many curious people stopped by yesterday to talk with the demonstrators — more or less cordially. One of them, seeing that a journalist was trying to photograph him, said very seriously: “Let me leave, please. I don’t want people to take me for a fag.” As for the soldiers who were there to keep order, they didn’t hesitate to hurl bad jokes at the participants, categorizing all of them as homosexuals. 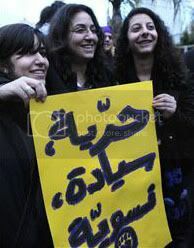 “We need to stop labeling people,” said Zeina, carrying a sign calling for the abolition of the law against homosexuality. “Whomever we love, as long as we don’t hurt anyone, love is neither hetero nor homo; love is just free.” The rally ended calmly, and Helem spokespeople said that this action would not be the last to promote the rights of the gay community and other oppressed minorities of the Lebanese society. 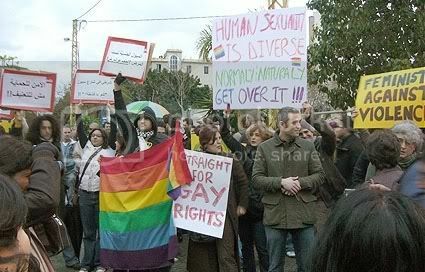 The original article “Rassemblement pacifique à Beyrouth pour le droit à l’homosexualité” was published by L’Orient-Le Jour on 23 February 2009. Translation by Yoshie Furuhashi (@yoshiefuruhashi | yoshie.furuhashi [at] gmail.com). Is Talking about Homosexuality Still a Taboo?